A highly talented sculptor and costume designer, Glenn, for many years, toured his own marionette show to community venues, establishing himself as a much sought after entertainer due to the unequalled quality of his figures. More recently, after undertaking a more formal two year study in art and design, he has diversified into making costumes for the theatre and other freelance puppetry including TV and commercials. Glenn has worked on numerous puppet characters for TV and stage and collaborated with Ian Denny on lecture/demonstration workshops, devising many new ideas to generate enthusiasm in puppet making and allow students to produce impressive results quickly and easily. Recently, he has been involved with several Midlands-based community arts projects bringing puppet-making to local schools. Glenn's puppets never cease to amaze with the flair of their design and painstaking attention to detail which is their trademark. His creations are truly works of art in their own right. 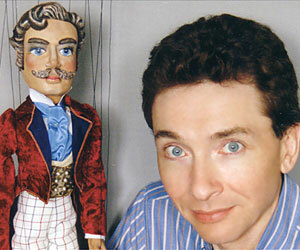 Ian's involvement in puppetry was given a head start by being fortunate to work with Eric Bramall and Chris Somerville at the Harlequin Marionette Theatre. An invaluable grounding in marionette manipulation. He went on to spend four years working in the theatre, making stage props and scenery, while building up his own marionette variety act, which he subsequently toured for fifteen years including five years of coast to coast touring in the USA. He also appeared as a Speciality Act on the Cabaret Circuit and Summer Season. Other engagements have included manipulation of a marionette alien creature in a science fiction film shot in Canada, freelance manipulation for TV, pop video and commercials. 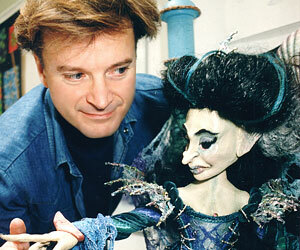 In recent years, in collaboration with Glenn Holden, Ian has worked mainly on puppetry lecture/demonstration workshops, while producing marionettes for new production "Beauty & the Beast". In 2005, Ian was honoured to be asked to take over the reins from Douglas Hayward in supervising the Hayward Puppet Exhibition on permanent display at Staffordshire County Museum, Shugborough Estate, near Stafford.